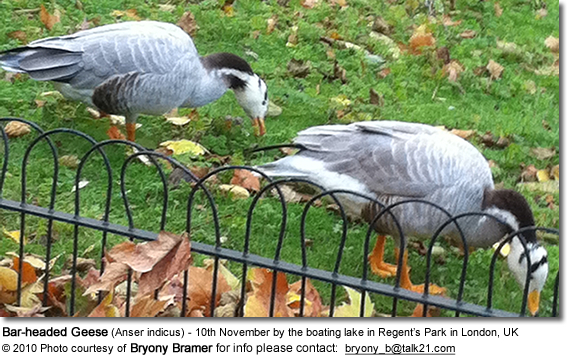 The Bar-headed Geese (Anser indicus) are named for the two distinctive brownish-black bars on their back of the head. 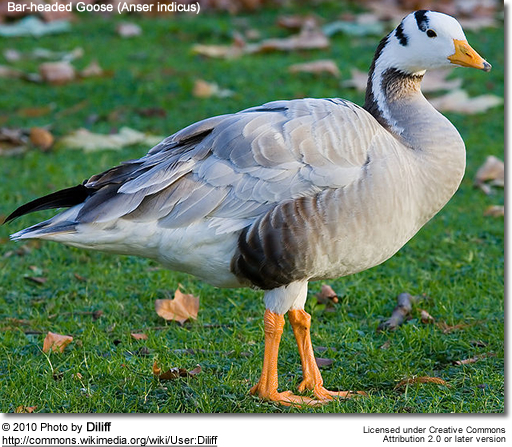 This goose is native to Central Asia. Azerbaijani: Da? qa? ... Belarusian: ????? ???? ... Catalan: Oca Índia ... Czech: husa indická, Husa tibetská ... Danish: Indisk Gås ... Dutch: Indische Gans, Streepkopgans, Strepen Gans, Stripgans ... Estonian: vööthani, Vööt-hani ... Finnish: Intianhanhi, Tiibetinhanhi ... French: Oie a téte barrée, Oie à tête barrée, Oie de l'Inde ... German: Streifengans ... Irish: Gé stríoc-cheannach ... Hebrew: ???? ?????? ?? ?, ??? ???? ... Hungarian: Indiai lúd ... Icelandic: Taumgæs ... Italian: Oca indiana ... Japanese: indogan, Indo-gan ... Korean: ???? ... Lithuanian: Indijin? ža?sis, Indijin? ž?sis, Kalnine žasis, Kalnin? ž?sis ... Norwegian: Stripegås ... Polish: ges tybetanska, g?? tybeta?ska ... Russian: ?????? ??? ?, ???? ?????? ... Northern Sami: Sárgescuonji ... Slovak: Hus horská, hus vrchovská ... Slovenian: tibetanska gos ... Spanish: Ánsar Calvo, Ansar Indio, Ánsar Indio ... Swedish: Stripgås ... Thai: ?????????? ... Turkish: Hint Kaz? ... Tuvinian: ??? ???? ... Ukrainian: ??????? ???? ?, ????? ??????? ... Vietnamese: Ng?ng ?n ?? They breed in the mountainous regions of central Asia north of the Himalayas ((southeast Russia, northern India and western China). For the winter, most migrate over the Himalayas to Northern India, some to Assam, Northern Burma and the wetlands of Pakistan. They usually nest near mountain lakes and prefer areas with short grass. During the winter, they favor cultivated grazing areas that provide opportunities to feed on their favorite crops, which are wheat, barley and rice. These long-distance migrants can fly a 1,000-mile migration route in just one day - as they are able to fly in jet stream; and they are one of the world's highest flying birds, having been recorded at altitudes of up to 10,175 m (33,382 feet). 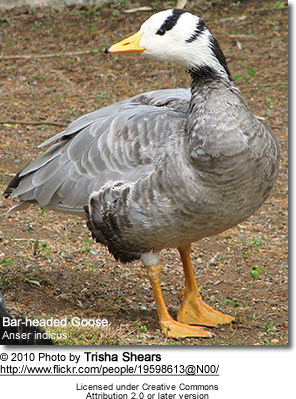 Bar-headed Geese are popular in captivity and they have been introduced in many areas outside their natural range. For example, escapes are frequently seen in Britain. These geese are generally peace-loving and generally don't interfere with native birds. Its wild population appears to be declining due to over-hunting. Waterfowl, such as ducks, geese, swans and cranes can cause problems around homes. 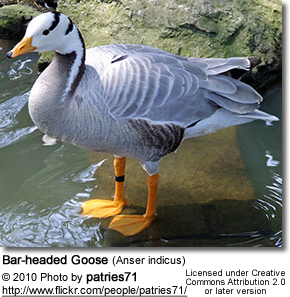 The Bar-headed Geese measure 71–76 cm (28-30 in) in length and weigh about 1.87-3.2 kg (4-7 lbs). The average adult weight is 5.24 lbs (2.38 kg) and hatchlings weigh about 5 oz or 141 grams. It has two brownish-black colored bars on the back of its head. 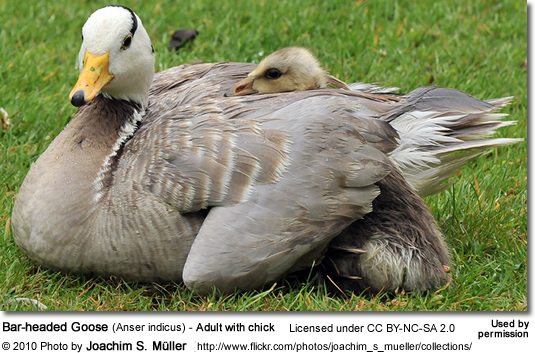 Its plumage is light grey (much paler than the plumage of other geese in this genus), except for the white face and neck. It has broad wings. The bill and legs are orange. The feet are webbed. 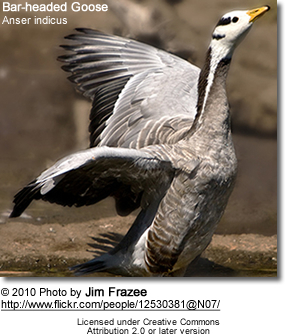 In flight, these geese emit the typical goose honking. 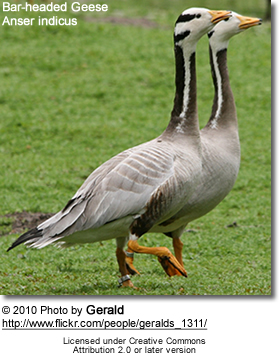 Bar-headed Geese usually start breeding during the spring-summer of their second year. They breed in colonies of thousands near mountain lakes. Most nest on the Tibetan plateau. Their ground nests are usually situated in grass or tall weeds. Most breeding activities are observed in May or June until July. The typical clutch consists of 3 - 6 (rarely up to 8) white eggs, which are incubated for about 27 - 30 days. 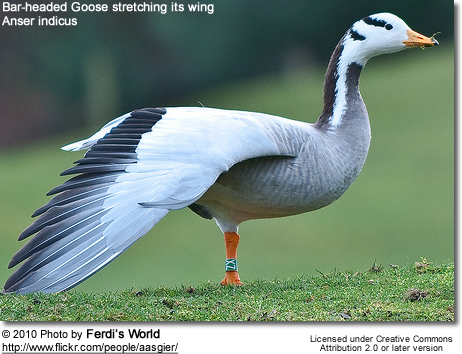 Bar-headed Geese often feed on agricultural crops during the winter in particular. Their diet includes : grass, wheat, barley and rice. Farmers in many areas consider them as pests. 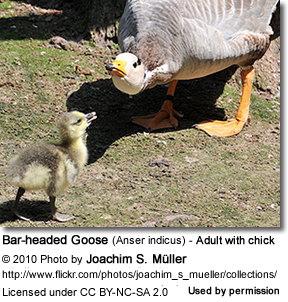 Geese generally feed on larvae and pupae usually found under rocks, aquatic animals, plant material, seeds, small fish, snails and crabs.